I have a relative that lives in Florida who mailed my mother in Virginia the below copy of a newspaper article that was published about 12-2000 in a newspaper in Florida. I am not sure what newspaper it was. This is “funny” depending on how you look at it. 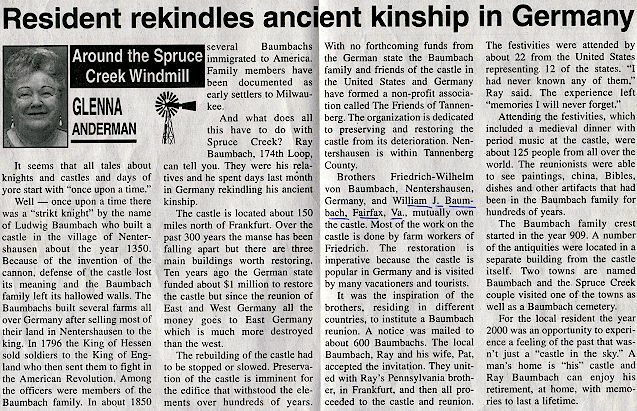 There is a misunderstanding by someone (Ray Baumbach or the reporter Glenna) that thinks Friedrich-Wilhelm v.Baumbach of Germany and (ME) William J. Baumbach II of Fairfax, Virginia are brothers and both own the Baumbach castle.